A spectrum of baby care, aromatherapy, spa and personal care products for head to toe. Transparency and honesty. For over 35 years, this has been the hallmark of our product integrity. 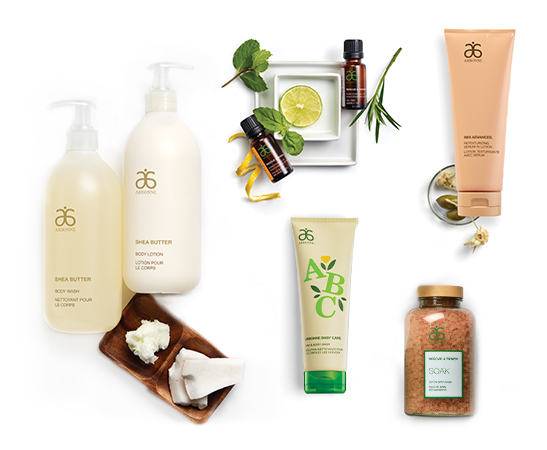 From the beginning, Arbonne has developed products by combining the best of nature with leading science. Our mission is to always improve and evaluate our ingredient policy as an ever evolving standard of excellence. This means we continuously challenge ourselves to do better and better. Our premium Arbonne anti-ageing collection, powered by age defying botanicals and scientific ingredients, promotes more youthful skin with visible results. Inspired by ancient Ayurvedic spa practices, this holistic approach to wellness focuses on the body’s flow of energy for the ultimate in self-care. A natural extension of the Rescue & Renew Collection to promote a more holistic lifestyle with a focus on self-care. Soft and smooth. Dry skin doesn’t stand a chance with the ultra-moisturising, luxurious Shea Butter collection.